This year we decided we are not going to do one 3 week trip, but we are going to take a few short ones. The first one came along between the long weekends of 27 April and 1 May. 3 days off work, and 9 days on the road, sounds like a bargain to me!! We decided on Baviaanskloof. Not too far away, still a very beautiful part of the country and a destination we have last visited in 2006. A lot changes in 9 years! With this trip we also wanted to maximise "relax" time and minimise "driving" time.. Therefore we settled on a long 1st day, to get us close to the beginning of the fun part, with a 2 night acclimatization period in a campsite. Then 3 nights inside Baviaanskloof, and then 2 nights in the campsite at Victoria Bay outside George... Way to civilised for us, but we thought, what the hell, let's give it a bash..
We left Brackenfell at 06h00 on Saturday 25/04 for George. The N2 is as predictable as Gwede Mantashe's next public announcement so not much to report on that. Once we got to Riviersonderend we caught up with Piet and Wouter, our traveling companions in a 3.0 D4D Fortuner 4x4 towing a Bushlapa off road caravan. They left about 06h00 from Gordon's Bay. 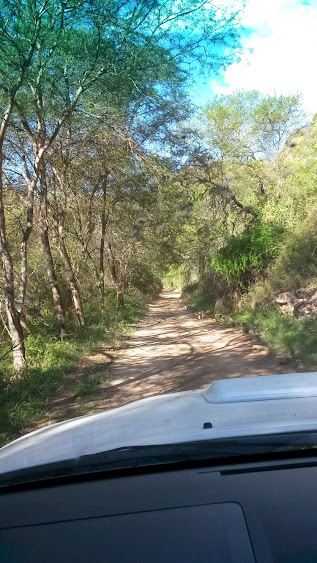 This was Piet's first real "overlanding" trip, besides camping at Groenrivier every now and then, so it was a steep learning curve for him towing the Bushlapa over mountainous terrain. In George we stopped for fuel, wood, and we went to the Men's Pharmacy. Once we were stocked with ice, braai wood and liquid refreshments, we hit the road to Montague Pass. This was a first for us too, we havent been along there before. It is really spectacular. After we crossed the mountain pass we were on tar again for about 300m before we turned off onto a dirt road towards Eagle Falls where we would be spending the next 2 nights. On this back road we came across this fella!! Eventually we made it to Eagle Falls and pitched camp on pristine green lawns with the sound of the waterfall in our ears.... So relaxing!! This was going to be the theme for the entire trip, we heard waterfalls, rivers and the sea every day and every night... Quite a change from Namibia, the Kalahari en Northern Cape that we are used to!! On my must do list; lived in PE for 9 yrs & never made a trip into Baviaans, money was a bit tight then.. Temperatures were fairly chilli at night with lots of dew, so wetness carrying cold into the bone structure... But during the days, although somewhat cloudy, it was warm enough to wear short sleeves.. No rain was experienced, until we hit Vic Bay... And then only a drizzle for about 10 minutes..
On Saturday evening after we pitched camp, we decided to go to the "bar" at Eagle Falls to watch the Stormers vrommel the Bulls... The owner Michal le Roux and his son was there and we felt right at home. After a few celebratories too many we went to bed for our first night on tour. The next day we didnt do much, except take a walk to the waterfall, and around the farm a bit. That evening we went to be d early so that we could be ready for the long trek through the Baviaans. Let me know if you cannot see the pics... They are shared to me from Piet's google plus account and I dont know if I can link to them from here so that you guys can see. If not, I need to copy them to my picasaweb album.. Anyway, Thanks Piet and Wouter for the use of your photographs..
Looks like another epic TR in the making! Thanks for sharing so far, Thys .... looking forward to the rest! The morning of our Baviaans Trek we woke up early and there was a sense of adventure in the camp. We broke up camp and realised that the Blonde and I can do it in the same time as Piet and Wouter managed to pack upthe caravan. We left Eagle Falls in great spirits, it was a nice place to visit, we recommend it gladly. Once we reached Uniondale, no ghosts in sight, we stopped in for breakfast at a local cafe, where we were treated to a lekker plattelandse plaasontbyt. We also stopped in at the Men's Pharmacy again, and the to Spar to pick up fresh bread and some Jalapeno chillies. After a quick splash and dash at the service station we waved goodbye as we drove up the long hill out of Uniondale, direction Willowmore. This pumpkin didnt want to go through the Baviaans so it ended up here in the veld next to the road. 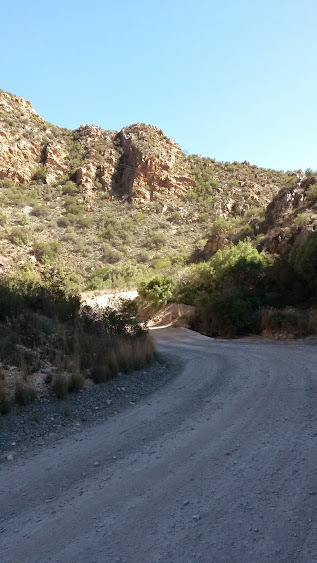 We have no idea how it got there, but it was completely undamaged..
We were on the dirt roads, and soon the road started going down into the Baviaanskloof throught the Nuwekloof pass. We stopped at Vensterklip. The road was long and hard... and we soon realised that lots can change in 9 years.... Road conditions deteriorated greatly, and potholes and washaways were plentiful. No complaints, it just made the going very very slow. Much slower than anticipated, so dilly-dallying was cut down to the bare minimum.. Some more pics of the drive... There were many water crossings, but the waterlevels in the river were low so no exciting of challenging water crossings. 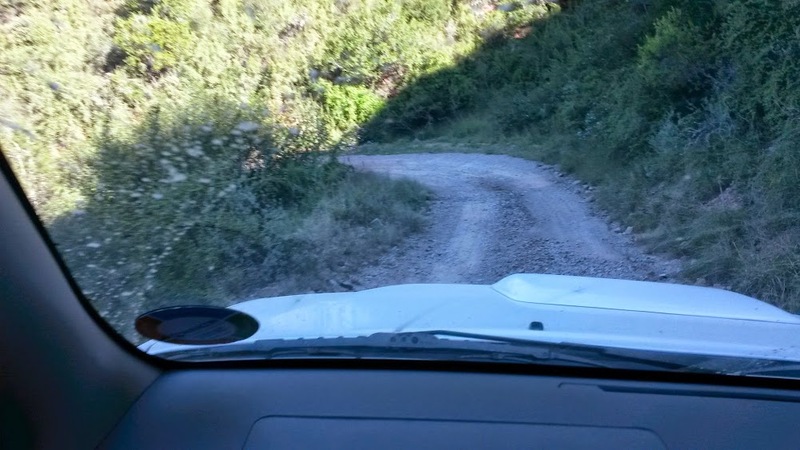 The drive was exciting, as the road was quite narrow and it seemed like the entire population of the Republic of South Africa was coming from the other side. We had numerous close encounters with bikers, especially around the tight bends in the passes. This was worrying, but I soon learned to stick to the left hand side as much aspossible and not to cut corners. Once again thanks to Piet and Wouter for the pics..
During our 2 days at Kudu Kaya we didnt do much, mostly walked around their magnificent campsite and around the farm. 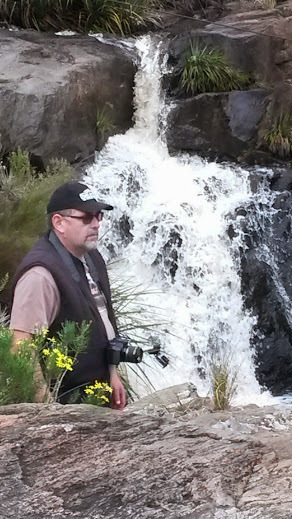 But on the first day, after a hearty breakfast, we decided to drive out to the Kouga dam to see what happens there. 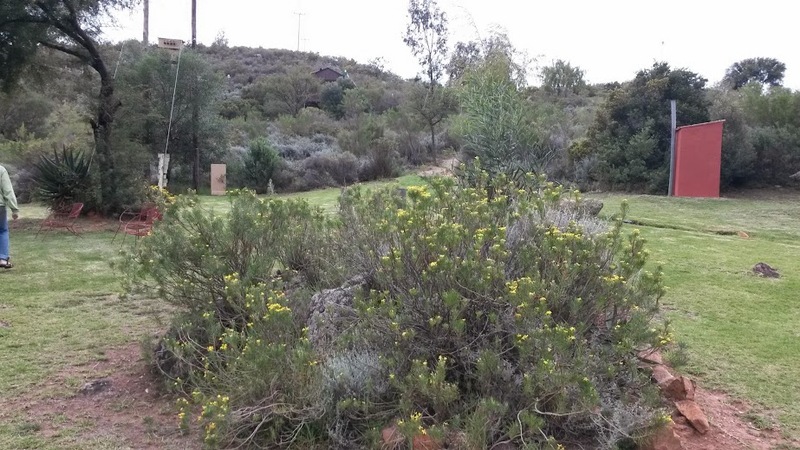 Photos of the campsites... There are some sites down by the river, which would be perfect for summer time when it gets really hot, but in April they hardly get any sun, so we chose to stay away from them.. 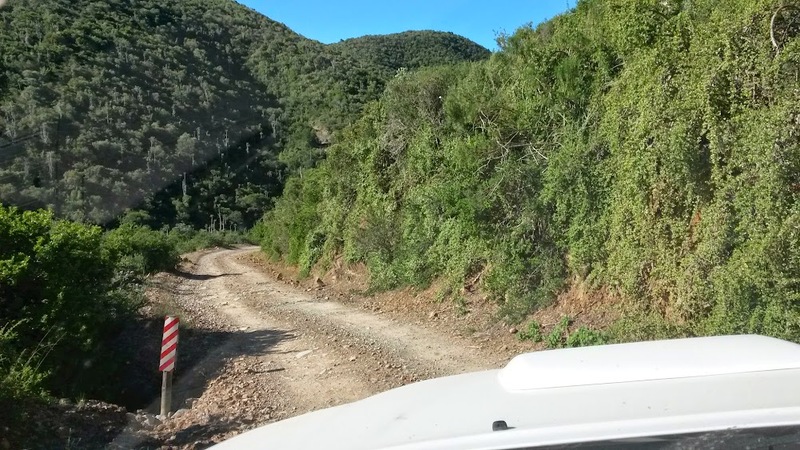 Here's a video clip of some of the less spectacular watercrossings.... We'll have to go back to get more spectacular ones..
Ek jik al lankal om weer Baviaans toe te gaan. Kudu Kaya lyk na 'n lekker kampplek. Thanks for reawakening the desire to go back there, Thys .... last time was in about '96 / '97 (I think). There's a bit more.... time is needed though... hahaha be patient..
Life long dream of mine! Definitely going there. Baie mooi Thys, beplan later die jaar dieselfde trippie, stuur asb jou itenary, verblyf besonderhede, ook kontak nommers. As jy GPS punte het sal dit help. Hello Johan. Dit was lekker om te chat op die foon. Ons itenary was eenvoudig. Ons het 3 oornagplekke gehad, en by elke plek het ons meer as 1 aand geslaap. Suiwer om kamp opbreek en opslaan tot die minimum te beperk. Jy kan alle besonderhede daar kry, jy kan ook sommer vir Michal le Roux bel, hy is die eienaar en is baie behulpsaam. Lang dag se ry. Kudu Kaya het ons met sononder bereik en moes in sterk skemer kamp opslaan. As ek dit weer doen sal ek of voor die Kloof on in die middel van die Kloof oorslaap. Daar is plekke. Helene is baie vriendelik en behulpsaam. Bel of epos haar gerus. Rydag 3 was van Kudu Kaya via Patensie en Hankey na Victoria Baai waar ons in die karavaanpark vir 2 nagte oorgestaan het. Waarmee anders kan ons help?